“The 2000 milestone is meaningless in and of itself,” says Rob Stein, CEO of Chicago based Astor Investment Management. But what is meaningful, he adds, is the current strength of the business conditions fueling the rally. If that keeps up, the market will keep going up, too, he predicts. 1. Housing – there were a lot of data points related to housing so I’ll sum them up in quick bullet points. Housing Starts: 1093K vs. 965K est. NAHB Index: 55 vs. 53 est. Building Permits: 1052K vs 1000K est. Existing Home Sales: 5.15M vs 5.02M est. Looking at these numbers, the housing market seems to have started drinking whole milk and is getting stronger. Starts and permits both exceeded estimates by a large margin and although much of the gains in these two have been in multi-family units, single-family saw healthy increases as well. Existing home sales moved the line closer to where we were in mid-2013 but remain 4.3% off last year’s peak. Median prices moved up to $222,900. Signs of inflation are starting to appear. While the headline number appears to be fine in relation to Fed targets (2.0% YoY), the annual rate using the last few months is notably higher. A drop in energy prices (-0.3%) in July helped subdue a 0.3% rise in food prices. Any strain on oil prices from geopolitical tensions could reverse this trend in the coming months. More information will be seen in the release of PCE this coming week. In short, labor markets need to show more signs of recovery before the Fed will start deciding whether rates should rise. Yellen has emphasized concerns about labor market slack for the last few months. Many viewed the Fed minutes last week as slightly more hawkish. A decent portion of the Street thinks the Fed is behind the curve and will let inflation run above target in order to give other measures of the economy time to straighten up. Equities caught fire last week. Comments from the Fed fell in the range of expectations and strong housing data helped propel stocks higher. Large and mid cap stocks put in a solid charge all week long while small caps bounced above and below to come back in line at Friday’s close. Traders bumped the S&P 500 within a few points of 2,000 while the NASDAQ continues to move closer and closer to all-time highs reached in 2000 (how many times can I use 2000 in a sentence?). Bond yields continue to remain under pressure although the strong buying action in equities helped alleviate some of it. What was sure to be a winning trade at the start of the year (i.e. short bonds) has turned out to be a head-scratcher for those who initiated the position. 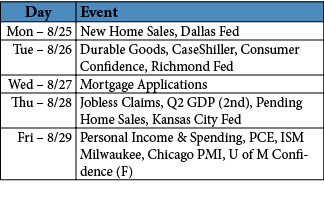 We have a full week of data ahead of us with additional insight into housing, manufacturing, consumer confidence, and GDP. There should not be much of a surprise in the second release of Q2 GDP and any revision will likely be to the upside (trade balance narrowed). I am keeping my eye on the CaseShiller 20 City Composite YoY number. Recent months have shown a steady decline in the rate of price increases. Additionally, July durable goods data will help set the tone for Q3 GDP. Geopolitical issues were shrugged off by traders and investors last week and it appears the market wants to push over 2,000 on the S&P 500. A solid move off Friday’s close of 1988 could provide the fuel to break through the resistance. With small caps barely positive on the year in terms of price change, there could be further upside to narrow the spread between the Russell 2000 (another mention of 2000!) and the S&P 500 which stood just shy of 8% as of Friday’s close. 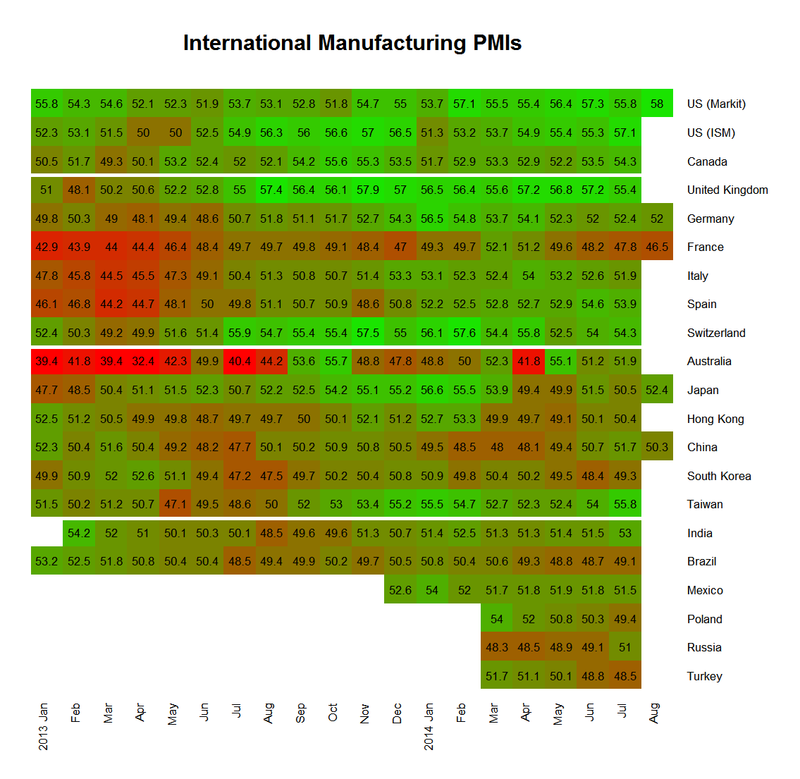 With the flash update for selected Markit PMIs for August, here is our monthly heatmap of worldwide manufacturing PMIs. The Markit PMI for the US jumped to its highest level since 2011. While this is an encouraging sign, the link between the Markit measure and the more familiar ISM measure is not as strong as you would imagine, and we see this as confirming the strength we saw in July’s ISM release. We were beginning to get concerned about Europe last month and that concern continues this month. France’s PMI is at a 15 month low and all of the big four Eurozone countries show month on month declines, though only France is below the 50 line showing that most companies are experiencing declining business conditions. China continues to oscillate around the expansion / contraction line but the strength in the rest of Asia makes us hopeful. In particular, on this measure at least Japan seems to be emerging from its post VAT increase slowdown. We have a note on ETF.com discussing the fixed income ETF world as we see it today. Check it out! The Kansas City Fed is hosting its annual Jackson Hole conference this weekend (motto: “interrupting Wall Street vacations since 1978”) . Several times in the last few years we have gotten a good preview of the Fed’s concerns for the year ahead by listening to the Chair’s speech. The last two rounds of Quantitative Easing, for example, were foreshadowed by Chair Bernanke’s talks. This is timely as one of the most important economic questions of the day is how much slack is truly remaining in the labor market. My forecast, along with many other Fed watchers, is that Yellen will make a point of emphasizing the slack remaining in the labor market. While the unemployment rate is approaching more normal levels digging deeper we do find evidence of slack beyond the unemployment rate. The number of involuntary part time workers, which I noted in this post, is very high, perhaps three million above typical levels. In addition, the lake wage gains above the level of inflation indicates that despite record corporate profits, employers are not finding it necessary to compete on price. The labor participation rate is more complicated. A large number of people have dropped out of the labor force since the recession though a mixture of the median American getting older and through the difficulty the long-term unemployed have in getting a new job. These contending forces are examined in an interesting report by the Council of Economic Advisors find that about half of the reduction in the labor force is due to aging and about half due to other factors we might hope to be reversed. Against these indicators of slack what do we see when we look for tightness? I noted the improvement in the unemployment rate above and referring again to my post from July, the quit rate and the job opening rate are both looking as good as they have since the recession and about as good as they did during the last recovery. Where does that leave the Fed? 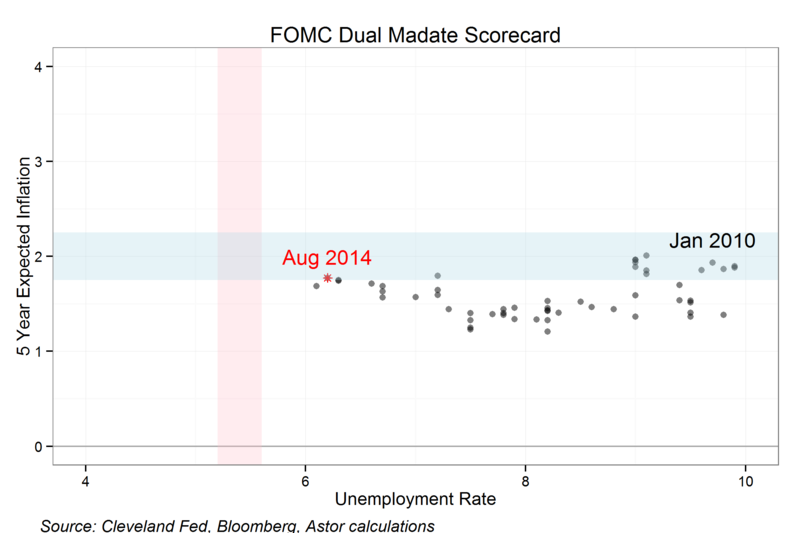 We can look at the Fed Dual Mandate Report Card below. The X axis show the unemployment rate (with the Fed’s estimate of long run unemployment in pink) and the Y axis shows five-year-ahead expected inflation (with the Fed’s 2% target plus an error band in blue). The details are explained in my post Janet Yellen’s Report Card. My interpretation of this chart is that the Fed is in the happy situation when its two mandated goals (price stability and full employment) are not in conflict so there should not be a reason to raise rates any time soon. In thinking about what the Fed will do in the future we need to bear in mind that by law they are mandated to try and manage both inflation and employment. My sense is that Yellen and most of the FOMC see today’s balance of risks tilted toward problems of employment and will let inflation expectations drift somewhat above their target. This may be a change in tolerances from what many of us are used to from the Fed policy in the 1990-2007 period, as economist Tim Duy writes: “Yellen can point out that since the disinflation of the early 90’s, the Fed has not faced an inflation problem, but instead has struggled with three recessions. This on the surface suggests that monetary policy has erred in being too tight on average.” I hope Chair Yellen will give us some clarification and some arguments to shape the discussion. 1. Retail Sales: 0.0% vs. 0.2% est. On a negative note, retail sales came in flat for July. 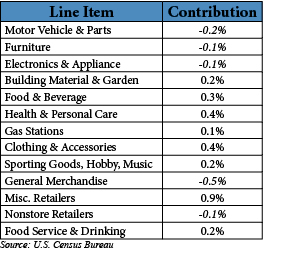 Consumers appeared to slow down purchases of big ticket items as motor vehicles, furniture, appliances, and department stores all saw declines. Falling gas prices over the last month and a half should give consumers’ pockets a boost in the upcoming months. 2. Industrial Production: 0.4% vs. 0.3% est. Industrial Production came in higher than estimated and a bonus upward revision of 0.2% for June was also thrown in for good measure. Manufacturing (1%) and mining (0.3%) showed increases while utilities (-3.4%) dropped due to less demand from mild summer weather. Motor vehicles and parts saw a 10.1% increase which marked the highest since June 2009 and contributed largely to the 1.7% increase in production of durable goods. The interesting part about this subset is the decline in sales for motor vehicles and parts seen in the retail sales number. All signs still point towards the manufacturing industry picking up and holding strong. 3. U of M Confidence (Preliminary): 79.2 vs. 82.5 est. Consumers threw economists for a loop with this release. The U of M reading hit a 9-month low as the outlook index fell to 66.2 from 71.8. However, another confidence indicator recently hit a post-recession high which appears to be in contradiction. It stands to be seen whether the U of M number means anything deeper. Most major indices remained a little shaky on Monday and Tuesday. Small caps roared out of the gates to start the week but quickly faded through Tuesday’s close. Mid-week the markets caught a bid as disappointing economic data allowed traders to buy with “The Fed will have to keep it’s loose policy longer” excuse. Friday appeared to be another risk on day until rumors about violence between Ukraine forces and Russian convoys started circulating. All-in-all, the week could be summarized as an average, low-volume summer week with Ukraine tensions causing turmoil. Investors on the sidelines have been using weeks like these to buy into the market. Treasury yields took a beating and the 10 Year is now firmly under 2.5% again. Bond investors piled into Treasuries last week as the flight-to-safety trade kicked into gear on Friday due to the Ukraine worries mentioned above. A fairly busy week lies ahead of us, especially for the housing industry. Reports on housing starts, permits, the NAHB Index, and existing sales will show whether the upward trend in housing is back in force. Other than housing, July CPI numbers should provide more insight on the inflation front coupled with FOMC minutes on Wednesday. It appears last week’s buying action had some legs so it becomes a question of whether further issues in Ukraine and Iraq will stir the pot or if domestic news will provide a trump card for traders here.